The London Ritz – ” What ?…. Again ” ? By Fortnums clock it`s Twenty past twelve on a cold London Sunday lunchtime.Time to warm things up with a wee trip to our favourite palace of the Pamper treatment. Within five minutes of sitting into the same seats and at the same table as always, the Ritz resident Pianist flowed straight into “From Russia with love”. It stopped my conversation dead in its tracks. I looked over and was greeted with a big `ear to ear` smile and a friendly wave…Oh wow , how good was that to start us off ? Now don`t ask me how…customer notes on the Ritz computer or just a good memory for faces ? either way i was totally gobsmacked and this is one of the reasons why i just cant`t keep away from the place. A collective of all the small things that transform the occasion to great heights and make the diner feel so very special.Not everyones cup of tea…But i love it. Now there`s always the option to go for the Traditional Sunday Roast Beef….if that`s your thing.On the other hand you can always let Chef `feel free to do his stuff`…Adam Smith , The Ritz head chef kinda likes us saying that. Once again , no menus and Chef would just send us out whatever he felt like cooking on the day. It was “The morning after the night before” so i was still very delicate from “Sommeliers choice” at Marcus Wareing. I opted out and stuck to water….and so the show started with little Amuse from the Ritz kitchens. Pressed Terrine of Goose liver with Rhubarb and Gingerbread. Steak Tartare with Parsley and Caviar. Langoustine with Cauliflower and Morels. Salt baked Celeriac with Perigord Black Truffle and Walnuts. The Photo below shows how it arrives from the Kitchens , all wrapped up and baked in a salt pastry crust.The Maitre`d will then carefully slice open the crust revealing the delights inside , in this case it was Celeriac root with Black diamonds….Fresh Perigord Truffles. A little Black truffle sauce and the aroma fills the whole restaurant. Cornish Turbot with Seaweed butter and Oyster. 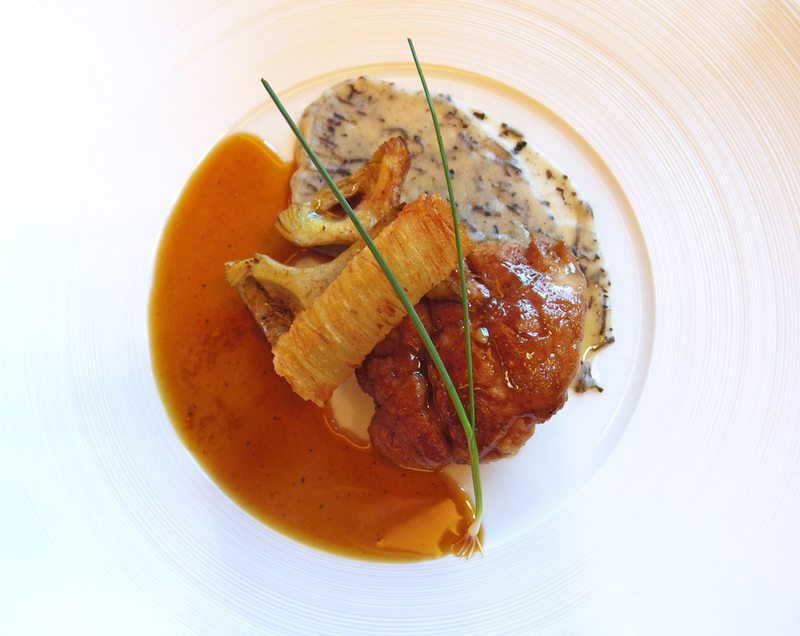 A really unusual and wonderfully rich main course, Veal Sweetbread with Artichoke and Black Truffle. Chocolate and Malt mousse , Caramelised Hazelnut and Malt Ice Cream. A little selection of Ritz Petits Fours with Coffee. To view a full set of photos from The Ritz , please CLICK HERE. Previous Post Marcus Wareing ” Chefs Menu ” at Londons Berkeley Hotel. Next Post Lenclume – 19 Course Sunday lunch. Absolutely amazing. I’ve never really read any foodie recommendations for The Rtiz, but this looks sublime. Pencilled in for next trip to London. Awesome , you won`t be disappointed , it really is classic fine dining at its very best.